The plastic fangs have been put away and the countdown is on: Only 354 days to Halloween! Until then, let’s lurch back a bit and see if we can extend the chills from the last one. Erick, over at Wonderful Wonderblog, posted excerpts from Movie Monsters, a kid’s activity book by actor, director and makeup man Alan Ormsby, published by Scholastic in 1975. 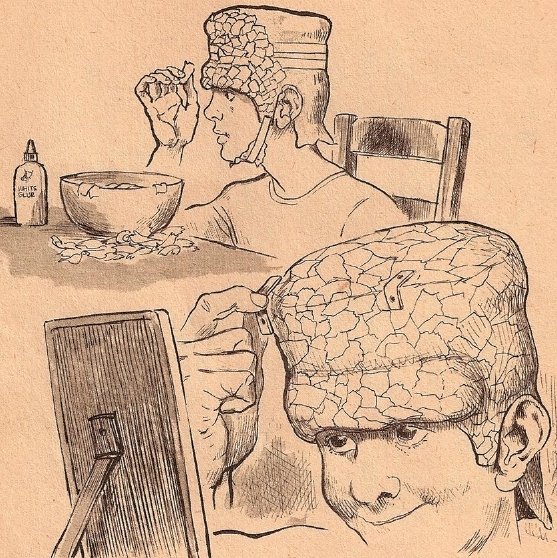 The Brown Bag Frankenstein Head looks fun enough to try, though I can’t help thinking the whole thing might collapse before you’re done. 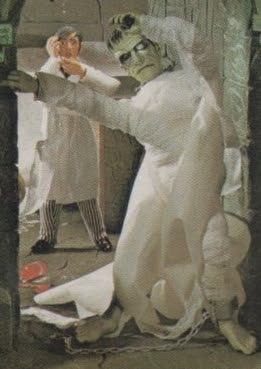 Erick also posted the entire booklet from View-Master’s 1976 Classic Tales Frankenstein. The uncredited writer did a fair job condensing the whole story into 12 short-short pages, even throwing in some puzzles, too! What I’d like to see now are the actual puppet scenes from the reel itself. Comic book writer John Rozum turned his blog into Halloween Central all through October. Scroll around, it’s loaded with goodies, including a terrific “How to make a ghost” post. Frankenstein got a whole week’s worth of attention (look for posts dated October 21 to 27) with Frankenstein movie reviews, lots of Frankenstein paperback covers, Frankenstein games and toys including Ben Cooper Wigglers and a beautiful Frankenstein Push Toy (pictured at right) trick or treating with his little skull-shaped pail. John’s blog is fun any time of year, and you should check out his unique cutout art, too, which also includes Frankenstein images. Shawn at Branded in the 80s posted some sweet Halloween stuff, notably a look at the Crestwood House Monster Series for young readers. 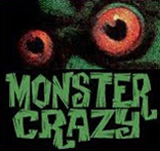 The Crestwood books, with their distinctive orange accented covers, infiltrated school and public libraries in the late 70s, introducing a whole new generation of kids to the classic monsters. 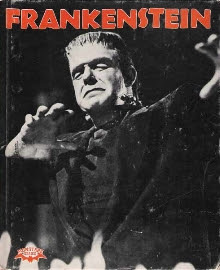 Shawn reproduces several pages from the Frankenstein book, surprisingly well-written and complete, given its short length, with shots of the Edison Frankenstein, Boris Karloff in spiffy street gear, The Munsters, and a rare, candid picture of Christopher Lee in his post-brain trauma stitched-up skull makeup. Hey, Shawn, now can we get a peek inside Frankenstein Meets The Wolfman? Trailers From Hell has the Abbott and Costello Meet Frankenstein trailer up with commentary by director John Landis. 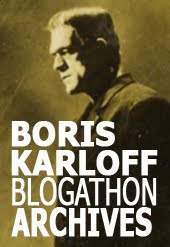 On Vitaphone Varieties, a superlative blog devoted to film and music of bygone days, Jeff Cohen looks at the first horror talkie, The Terror (1928), the early SF musical Just Imagine (1930), complete with mp3 excerpts, and the 1931 Frankenstein, reproducing a contemporary ad disguised as newspaper article, “Miracle Performed by Dr. Frankenstein”. And on the indispensable Video WatchBlog, Tim Lucas, who has developed a brilliant perspective on Peter Cushing’s interpretation of The Baron through the Hammer Frankenstein series, writes a vivid appreciation of a new HD version of Terence Fisher’s Frankenstein Created Woman (1967). This one is a Must Read. I have the viewmaster Tales of Frankenstein discs still too... but I don't have the booklet!